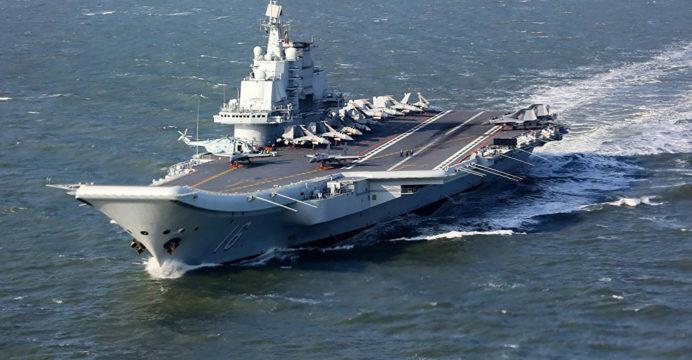 China intends to conduct mooring trials for its first domestically constructed aircraft carrier in September, says Hu Wenming, the general director of the carrier’s construction (via People’s Daily Online). Dalian Shipbuilder had launched the aircraft carrier for sea trials in April. Known as the Type 001A, the carrier is derived from the Soviet-era Kuznetsov-class carrier Varyag, which China bought in an incomplete state in the late 1990s through a privately-owned Hong Kong-based business. The Varyag was then completed and fitted in China. It was launched as the Liaoning, which the People’s Liberation Army Navy (PLAN) declared as “combat ready” in November 2016. The Type 001A inherits the Liaoning’s short take-off but arrested recovery (STOBAR) aircraft launch layout, but Chinese media sources claim that the Type 001A can carry additional aircraft. Regarding the Type 001A, Hu Wenming told the People’s Daily Online that 412 entities, including state-owned corporations, private companies and research and development agencies, were involved in the development and production of the Type 001A. Domestic inputs constitute 77.4% of the Type 001A content. In September 2016, satellite imagery (via IHS Jane’s) indicate that China is testing Shenyang J-15 carrier-borne fighters modified for catapult-assisted take-off but arrested recovery (CATOBAR) flight decks in anticipation of China’s third carrier, the Type 002. Aircraft carrier development and production constitutes a major portion of Beijing’s plan of enhancing the PLAN for better addressing China’s regional naval threats and interests. In the lead-up to inducting aircraft carriers, the PLAN has largely modernized its surface fleet with multi-mission frigates and destroyers, such as the Type 054A and Type 052B/C/D, respectively. The mainstay of the PLAN’s patrol and anti-submarine warfare (ASW) force now comprises of Type 056 corvettes. The PLAN has also expanded its amphibious deployment capabilities through the induction of Type 071 landing platform/docks (LPD) and Type 072 landing ship/dock (LSD). It has also built a modern land-based air arm comprising of various fixed-wing fighter aircraft as well as ASW and surveillance aircraft. In parallel with aircraft carriers, the PLAN surface fleet will see the addition of large anti-air warfare (AAW)-capable multi-mission destroyers, such as the 10,000-ton Type 055.